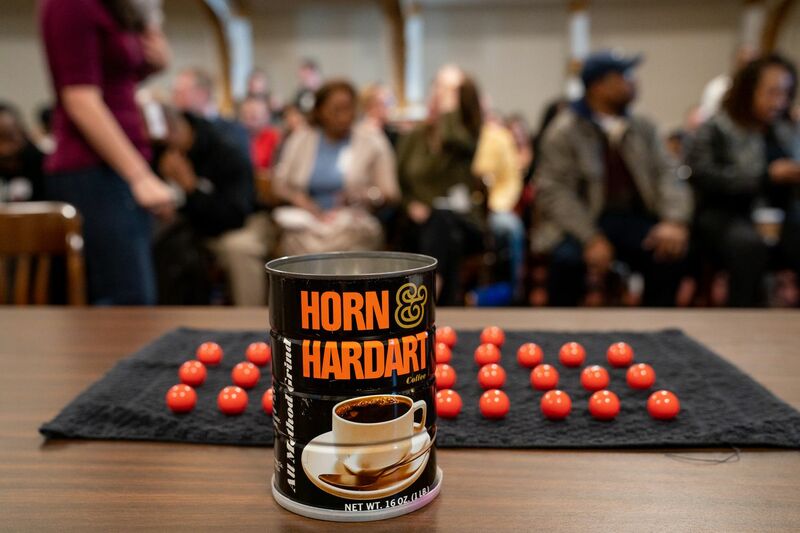 The coffee can and numbers used to draw for ballot positions at City Hall, in Philadelphia, Wednesday March 20, 2019. When ex-traffic court judge Willie Singletary was sentenced in 2015 to 20 months in prison for lying to the FBI during a corruption investigation, the sentencing judge called him so unqualified for his office that his election was a symptom of a diseased political system. That same Willie Singletary is running for City Council, and is likely a front-runner by virtue of the fact his name is the fourth one voters will see on the list of more than 30 Democratic Council candidates on the ballot. Singletary got that plum position because he picked a small red ball out of an old Horn & Hardart coffee can -- a decades old Philadelphia tradition that has gotten no less stupid over that time. In low information races, ballot position matters a lot. On election day, voters are asked to make a lot of choices. In the upcoming primary, voters will need to choose the mayor, City Council members (district and at-large), City Commissioners, Register of Wills, Sheriff, Superior Court judges, Court of Common Pleas judges, and Municipal Court judges. Every Democratic voter will need to select 20 names and every Republican voter 16 names. Knowing the qualifications of dozens and dozens of candidates to then be able to select the most qualified 16 or 20 people is an extremely hard task. After people choose the few names that they know for the offices that matter to them, voters just pick the first names on the list. For some candidates, running for office is basically a game that is decided not by election but by a coffee can. For example, David Conroy was running for both an at-large seat and a Municipal Court judgeship. After he was essentially guaranteed an appointment as a judge by picking the number one ballot position in the Municipal Court race, he dropped out of the Council race. The can determined his destiny. Merit, not ballot position, should be the deciding factor in elections. In cases where there are lots of candidates, there are alternatives to make it fairer. One way to cancel out the ballot position effect is by using technology. According to the Office of the Commissioners, the new voting machines that the City is planning to purchase will likely be able to randomize the ballot positions for every voter. That would require the state’s election code requiring a lottery for ballot position to be overturned. What better reason to change a law than to strengthen the integrity of our elections? From City Council to judges, the stakes of offices are too high to rely simply on luck.